15 year old showcased her vocal wares with CD release celebration August 8 at Four Day Weekend Comedy Theater. 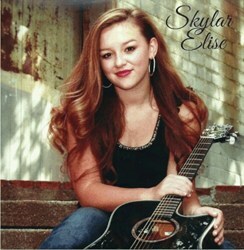 August 8th, 2013 marks the debut CD release on Sugar Money Records by 15-year-old country songstress Skylar Elise. Her six-song set features new country music with a flair and a confident sense of the genre in its maturity, even at her young age. Dallas-Fort Worth, Texas’ Skylar Elise is an American country music singer, songwriter and multi-instrumentalist. She was only eighteen months old when she started singing her first song by Shania Twain. Her musical career began at the age of three when she was given her first piano and microphone. Skylar made her first appearance at a local sports event where she sang “God Bless America”. Skylar has played piano since she was 5 years old and took guitar lessons for three years. Playing guitar came so naturally for her that she began to play by ear. She writes, sings and plays her own music. Skylar’s first public performance was at the age of six. She has been a member of God's Country Kids for eight years where she has performed at nursing homes, senior citizen living facilities, talent shows, sporting events, and cancer benefits. She sings solos at three different churches including Church On The Slab, a church for the homeless, and her own church Glenview Baptist. Skylar also has performed for numerous local outside festivals and at Johnnie High Country Music Revue, Grapevine Opry and Wylie Opry. Skylar has been a Nashville recording artist since the age of nine and has been in development for the last year with Nashville producer D. Scott Miller. Now Skylar’s dream to become a worldwide entertainer is becoming a reality.